I rarely do product reviews but when I do, I make sure that the products really work, and were personally tried and tested by me over a certain period of time to validate their efficiency. I was down with shingles (adult chicken pox) last week of May and I wrote an article regarding the experience. Being down with adult chicken pox is twice as hard because it not only is a highly-contagious illness (for which you greatly fear that you will infect other members of the family) but because it is also very painful (not to mention itchy) and annoyingly targets the face, arms, torsos and legs; hence, causing nasty dark marks and scars as the aftermath. Unlike fever, flu, body malaise and other common illnesses, shingles cause scarring which takes months to fade and heal, even leave permanent marks and a lifetime emotional trauma for someone who has been through it. Having facial scars from breakouts, acnes, and chicken pox greatly affect one’s self-esteem and honestly, I never experienced that feeling of inferiority and shame as people stare at my scarred face the first time I went out publicly. I felt sorry for myself. And although a lot were sympathetic, some people sadly can be very judgmental especially when it comes to other people’s appearance. And even though I am assured that my scars will soon fade out, my concern still goes out for those who have to face the same pain of dealing with the scars every day. 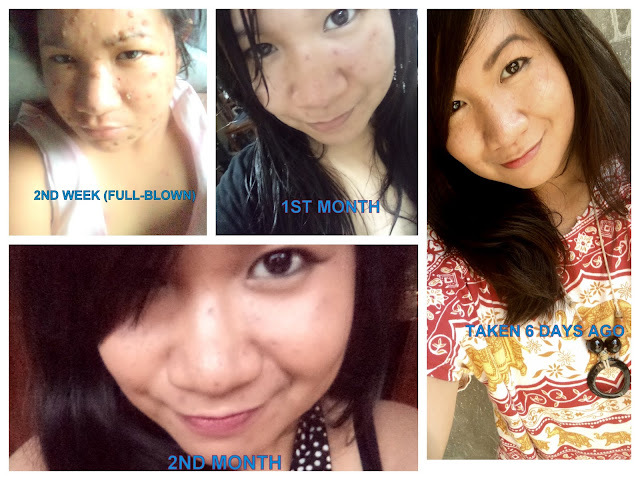 And so promised myself that I will look for affordable and mostly over-the-counter products that will effectively eliminate and heal scars and will share it to others who not only had the same experience but even those who have dark spots and fresh facial scars from pimples and breakouts that are desperately looking for certain products that work. Mind you, that all these products were all purchased out-of-pocket and I wasn’t asked or paid by their manufacturers to endorse their products. I will skip all the active ingredients and chemical components (maybe just pinpoint one or two) for technical purposes. In case you are curious about the complete compounds, please try to search for them individually online. I will also highlight their pros and cons, so as the observations and results. I had been using a specific Kojic soap for many years but when I had chicken pox, it irritated the fresh wounds so I had to stop using it and try some other beauty soaps. I watched YouTube clips and read reviews for local brands of soaps that are effective to reduce and get rid of pimple marks and dark spots and Royale Beauty L-Gluta Power Soap is highly-recommended. And so with fingers crossed, I tried it. What’s so great about it is that it doesn’t really have that overwhelming smell that most whitening soaps have and it lathers well, leaving my skin feeling clean, soft and supple. And what’s even more exciting is that, it not only helped whiten my chicken pox scars but so as my entire face, too. My mother who wasn’t aware that I just started using it made a comment that my face whitened in just 4 days of using it! Yes, 4 days! So I became very positive about its claims of removing dark spots, reduce and get rid of freckles, age spots and pimple marks, whitens skin, revives skin suppleness and nourishes skin to make skin look radiant and flawless. I am still using it day and night as a part of my new beauty regimen and absolutely would recommend you to try this, too if you want to remove those nasty scars. It is a bit pricey for a bar soap compared to the other brands of whitening soaps that are readily available in the market. The cost is P198 or $4.33 dollars per bar, although it is worth the price! What I do is that I cut the bar soap into 4 parts so I can maximize its longevity and to avoid it from melting that easily. Also, you can only buy it on specific kiosks that sell Royale Beauty and Wellness products or you have to directly order it from a Royale Beauty Distributor. As for the product itself, you’ll expect that there will be a slight stingy feeling in your face but that only means that it is working. The good thing about it is that it has Vitamin E to keep your face moisturized. It was my younger brother who recommended Pond’s White Beauty Detox cream. He also had shingles years before me and attested that this helped him remove the chicken pox marks. And so before the actual purchase, I have to read the reviews and was so glad with all the positive remarks about its effectiveness. I am using the one that comes in a lube with a cap. What I love about this product is its matte powdery finish. Second, it is super affordable and readily available even in drugstores. Plus, it has a cap which prevents messy spillage which I greatly dreaded when using products that goes in sachets. I so love the smell by the way. Pond’s have this signature scent to all of its products (fresh and citrusy). I was surprised honestly because it exceeded my expectations coming from a super affordable beauty product. In just a week, the red marks apparently became lighter and less visible. I can attest that this product works wonders! Pond’s White Beauty Detox (Spotless White) comes in two variations; one is the cream with the lube and a cap that has the matte finish while the other one is the Pond’s White Beauty Detox Lotion which is lightweight in texture. I prefer to use the cream which leaves the matte feeling although you have to be fast in applying it generously in your face else it will cake out easily which makes it hard to blend. Unlike the Detox lotion which is a bit water-based, it will smoothen evenly when applied. I also have a combination-to-oily skin so after hours of applying the Detox cream my face is already oily but honestly, I don’t really see it as a major off because the product is effective. Also, as a head's up, it doesn't really whiten the whole face, instead it targets to lighten the dark spots to even out the skin tone. If you read the caption at the back of the bottle, you will see this question “Do you believe a single bottle can do miracles? True to itself…it does magic! I love Human Nature as it is absolutely 100% no harmful chemicals added and for those who are not aware, sunflower oil is a great source of Vitamin E which is fastly absorbed by the skin. Human Nature Sunflower Oil I would say is the most versatile beauty product that I have as it eliminates my stretch marks and whitens my underarms (aftermath of my pregnancy), reduces dark spots and pimple marks, get rid of my son’s diaper rash and I apply it to even-out my elbows and knees and put it as my hair’s leave-on (which makes my hair softer and healthy looking). I also use it as a makeup primer as foundations and concealers glide so easily and they blend well on my face. When I was already on the scabbing and peeling stage, I started applying Human Nature Sunflower Oil and I love how my skin absorbs it. It soothed my scarred face especially when it was super itchy from all the scabs. Because of its effectivity and affordability, I usually give it as a birthday present to my friends and relatives. The miracle oil is exclusively distributed by Human Nature so you need to get in touch with a local dealer. For areas which do not have Human Nature centers yet, you can purchase the Sunflower oil from their official website online. It doesn’t have any smell though I don’t see it as an issue. I suggest that before you apply it directly to your face; do a skin test first by putting a small amount at the back of your hand as I have read some comments from Human Nature’s website that there are some who experienced allergic reactions and breakouts after using. Anyway, the Human Nature management is so accommodating when it comes to issues like those, accepts returns and gives out further suggestions on other possible products that might work from their beauty line. Another product of Human Nature which I fell in love with is Human Nature 100% Detoxifying Mask+Scrub and had been using it even before having shingles. For starters, this doesn’t really whiten the dark spots but it is a great facial scrub and a mask that helps detoxify my scarred face by removing the dead skin, giving way to a healthier skin underneath. And since it is 100% chemical free product, the micro-beads of the scrub are all natural, too--a combination of strawberry seeds, bamboo granules, and kaolin clay, plus skin-renewing multi-fruit extracts that unveil fabulously soft, smooth skin. I am a sucker of anything with berries and the smell of this Detoxifying Mask is fruity and a bit bubble-gummy which I really like! I started the scrub on my first month after the scabbing-off to avoid further scratching of the wounds. I do it once or 2x a week and it greatly helped to rejuvenate my skin. Just like what I have stated on the Human Nature Sunflower Oil review, some who used it experienced allergic reactions and breakouts so if you have a super-sensitive skin, try to get in touch with Human Nature first for a possible free sample or a money-back guarantee. Since this is a scrub, expect that your face will be a bit red from all the lathering with the natural micro-beads but it will soon be gone even before you knew it. Lastly, it again is exclusively distributed by Human Nature so contact a dealer in your area to order this or purchase it online. I am always hesitant to use facial cleansers and toners because of their stingy feel but when I was in Mercury Drugstore one time and had the chance to scan their shelves, I came across this Extract Licorice Whitening Facial Cleanser manufactured by Splash Philippines and since I read its claim that it “intensively whitens darken spots and uneven skin tone” I decided to give it a shot. And I am glad I did! I love the fact that it doesn’t have a stingy feel on my scarred face instead leaving a cool, fresh feeling every time I use it. I started using it the day I used Royale Gluta-Power Soap and the combination of these two products is really amazing! My chicken pox scars lightened up fast just by using it in several days, hence, leaving less visible spots. I would say that I will continue to use this as my toner since it delivers more than it promised--not to mention that it is less than P30 for a 75 ml bottle to test it. I tried to browse this product on several known grocery stores to check its availability but not most of the time it is being sold. What I know is that, it is always present in Mercury Drugstore so if you want to try Extract Licorice Whitening Facial Cleanser, then raid the nearest Mercury Drugstore in your area. I really did a lot of research and reviews and most of them will pinpoint that Vitamin E is the most effective component to heal damaged skin. Vitamin E is a powerful, fat-soluble antioxidant that helps protect cell membranes against damage caused by free radicals. And so when my chicken pox scars are just on its first few weeks of healing process, instead of taking Myra E orally, I’ll prick the capsule with a needle, causing the Vitamin E oil to gush out. After which, I’ll dab a cotton bud or a Q-tip and will apply it directly to the chicken pox scars and leave it for at least an hour. I do this routine 2x a week, every after the Human Nature Detoxifying Facial Scrub to soothe my scarred skin. Sometimes I will mix it with the Human Nature sunflower oil. It not only evens out the skin from the scars but it also helped to lighten the spots. The Myra E is very affordable and is effective not only to reduce pimple and acne marks but also to heal skin cuts and scratches and eliminate permanent scarring. Although Myra Vitamin E has no known toxicity or side effects there are users who claim that Vitamin E caused burning, stinging, redness, or irritation on their skin so I highly recommended that you do the skin test again for any allergic reaction before directly applying it to the targeted spots. The Vitamin E oil is very thick so when you dab it to the marks, you may feel this oily, uncomfortable tingling feeling so you might want to just bear with it depending on how long will you let it stay on your face. Even though our skin has the natural capability of healing itself especially from skin irritations and damages caused by chicken pox, acne, pimples and breakouts, using the following products I mentioned will speed up the healing process and even reduce and eliminate the ugly scars while they are still new. It took me almost 3 months of using these products to make sure that when I’ll do the review, it is credible enough to educate you guys. Some of the products had instantaneous results, others are gradual but the combination of these beauty products helped me immensely to have a clearer skin now. And although there are more expensive means of getting rid of the chicken pox scars like micro-abrasion or natural ways like Aloe Vera and honey, again my goal instead is to look for over-the-counter products that are affordable and readily available. The healing process will take time so make sure that you are patient with it. Try to fight the urge of scratching the scars or to irritate it more. And honestly, as I look at myself in the mirror, even though there are deep scars that I know will never be removed and my face will never be the same as before, I am still happy that 80% of my scars had cleared now while 20% is less visible and I just need light-medium coverage for a finish. All of a sudden, the comical question “how can you face your problem if the problem is your face?” doesn’t sound funny to me anymore, not after what happened. The experience taught me that the real crust of beauty doesn’t really lie on the outer surface which can easily be destroyed by external factors but it is more on acceptance of the present circumstance, understanding the beauty that lies within while trapped in the ugliest situation and moving forward by continuously loving yourself no matter what. “How can you face your problem if the problem is your face?” haha! That never gets old, especially when it's true. I have a new product I'd like you to try and possibly add to this collection. :) I'll try it out first and then let you know how it works for me. Heheh. hey did you indented scars heal over time? I don't think there's anything which can heal scars. They can fade or lighten though. It also depends on what type of scar it is. Ice pick ones are the most difficult to deal with. You can try laser procedures though but don't expect much. where can I buy Pond's detox? Most supermarkets, groceries and drug stores sell it.